We already know the Fed did not raise rates during the April FOMC meeting, but today's minutes could provide new hints about whether a rate hike at the Fed's June 14-15 gathering is possible. As widely expected, the Fed left interest rates unchanged between 0.25% and 0.50% in April. Rates have rested in that range since December 2015, when the U.S. Federal Reserve interest rates were raised for the first time in nearly a decade. Citing the mixed global economic signals and low government-reported U.S. inflation, policymakers said at last month's meeting they would remain accommodative and careful when it comes to raising interest rates. Still, Fed officials provided very few clues about when to expect the next Fed rate hike. But very few analysts expect an interest rate hike following the June FOMC meeting. According to CME Group's FedWatch tool, the market is placing just a 7.5% chance of an interest rate increase in June. But the June meeting is still a crucial one. What the Fed says and does at the FOMC meeting next month could help determine how many times the Fed raises interest rates this year. When the Fed raised rates in December, it penciled in four interest rate hikes this year. It then reduced that number to two. Now, some analysts say they don't expect any hikes in 2016. 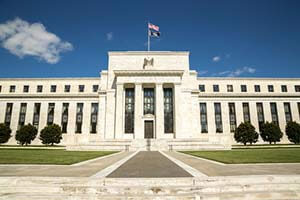 In the Fed's statement following the April meeting, policymakers noted the U.S. economic recovery remains uneven. The statement said that market conditions had improved, even if economic activity was still sluggish. It also noted household spending weakened even though real income rose and consumer sentiment remained high. Fed officials will have two months of data on inflation, the labor market, and two estimates of first-quarter growth (GDP) between their April meeting and the June FOMC meeting. U.S. unemployment is trending steady at 5%, and the Fed's preferred measure of inflation has been under its 2% target since 2012. The Fed was worried about stock market volatility at the start of the year, but that has lessened as major U.S. benchmarks sharply rebounded from February lows. Still, economic growth and corporate earnings have been disappointing. Developments overseas are also being closely monitored and will play a key role in the Fed's actions. The word "global" was used 22 times in the April statement. Particular focus is on the UK. Atlanta Fed President Dennis Lockhart said last month the unknown outcome of the so-called Brexit vote "might weigh on a decision to be patient in June" about raising rates. A vote for the UK to leave the EU could have destabilizing consequences for the world economy, Lockhart said. Dallas Fed President Robert Kaplan said in February that a Brexit presents a risk to global stability and central banks are "watching it carefully." The latest odds of the UK leaving the EU are at 31%, but worries are real and running high. The vote takes place on June 23. Chances of a June interest rate hike are nearly nonexistent, and April's FOMC minutes are expected to reflect that. So, investors will pick through the minutes to find out where the Fed sees trouble and then position their portfolios accordingly.